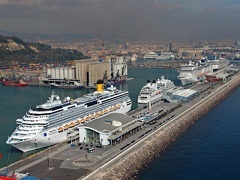 The Barcelona cruise port is the gateway to all that is wonderful about the grand city of Barcelona. As one of the most popular of the Mediterranean cruise ports, it has a great transportation system and with so much to do, you will probably wish you had more than a day in this historic city. Mykonos. Perhaps ‘the’ Greek Island to see for it’s hard partying style and celebrity interests. It is the most expensive of all the islands but boasts a beautiful port and all the luxury that you can handle. The Venice cruise terminal is the gateway to glorious Venice. The watery streets, the gondola rides, the history and the architecture all make this a place a must on a list of favourite ports in the Mediterranean. Ibiza. Once a party island now is a mellowed out place for sightseeing. It is a World Heritage Site and one that is legendary as a Mediterranean stop. A list of the best Mediterranean cruise ports would not be complete without Monaco. This tiny island can be explored on foot in only a few hours and is known for Princess Grace just as much as its Casino and nightlife. The Kusadasi cruise port opens up Turkey to cruisers of all ages. Known for its archeological sites, and for shopping and sightseeing, this makes the list for its uniqueness and history. Nice or Cannes as the cruise lines like to call it is a charming place with pebble beaches and cobblestones. With outdoor markets, plenty to see and old world charm, this destination is hard to top. Dubrovnik cruise port is known as the ‘Pearl of the Adriatic’ and features cobblestones, terraces and a certain grace that allows it to be easily explored and enjoyed. Livorno. A day trip to Florence – Italy’s must see city features the ‘Il Duomo’ and the famous ‘David’. Filled with history and landmark architecture it is a must stop destination on any Mediterranean cruise. Santorini. One of the most famous of the Greek Islands, this is full of whitewashed buildings with blue roofs, black sand beaches and postcard worthy views. Mediterranean cruise ports are as varied as the cruise liners that make stops at them. Check the itinerary of your cruise to see that your favourite ports of call are included.